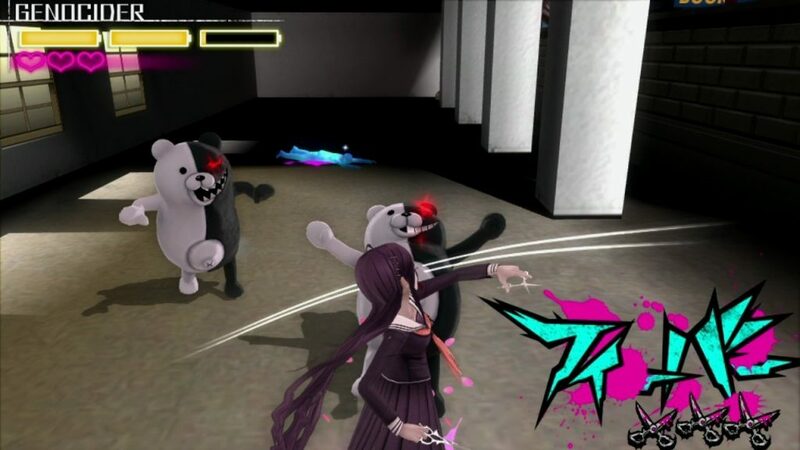 Review Context: Having played the previous two Danganronpa games and loving their visual novel/point and click style of play, I was interested in this new third person shooter formula. Now we often find series of games branch off to new horizons as they try to reinvent or give a new experience to their fanbase. Megaman X had a shift from 2D sidescroller to 3D, which was not well received because it bogged down the formula and made the game feel sluggish, as well as the addition of Axl, making it seem like X was obsolete. On the other hand, the creators of Ico devised a completely different game in the form of Shadow of the Colossus. Here we see genius in motion so to speak, taking the puzzle aspects of Ico and merely adapting them into complex and intense fights against giant colossi. Here we have two different series with two different reactions to their shifts in focus. Danganronpa Another Episode: Ultra Despair Girls descends from its original visual novel/point and click adventure style for a third person shooter. Will it follow the path of the disliked 3D Megaman X games, or will it shine much like the Shadow of the Colossus? This is what needs to be addressed when looking at this beast. 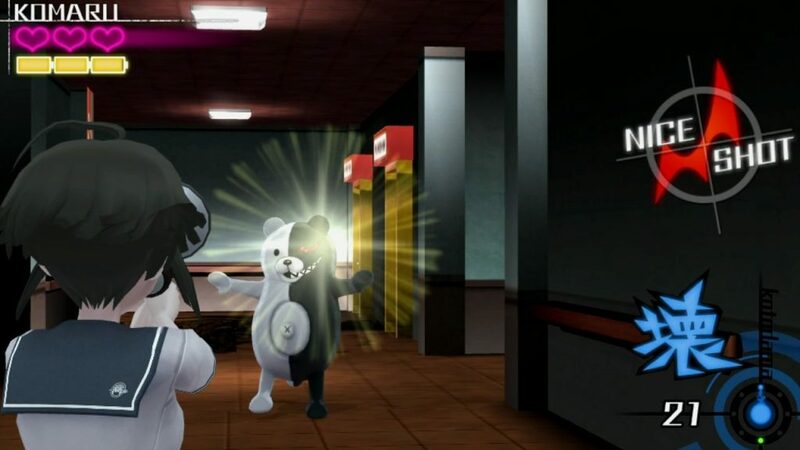 Now this is supposed to take place in between the first and second games and expand upon the world of Danganronpa, delving more into its history. You play as Komaru Naegi, Makoto’s younger sister, as she is thrown into a horrible situation after being kidnapped and locked away. You are being hunted by the Warriors of Hope, homicidal children who wish to build their own paradise without adults. This type of personalized story where the focus is on a smaller cast of two (Toko Fukawa and Komaru Naegi), is something not done in the series previously. The story of this game delves more into the world of Danganronpa, building up to the third installment of the game, so this should be the last one played of the three already in the series. This time Danganronpa didn’t hold back, as it is most certainly the most vulgar and gory one in the series, with a lot of depressing themes wrapped into its cheery psychopathic feel. I feel this is how they desired the world to be like, broken down with no morals, with fear and sadness reigning supreme. This is probably the most adult Danganronpa world we’ve seen, but in there can lie some issues with how people can take it. This isn’t as easy to take as the last two games, and delves into themes and emotions I’m certain would be hard on most if they take it seriously, and that is where they shine. It is depressing and thematically great, with a great story rivaling Danganronpa 2: Goodbye Despair. The reason why this game works so well is attributed to both its depressing themes and its great characters who you can’t help but dislike, or just feel plain uncomfortable around. Many of these characters are cowards, sociopaths, and potentially heroes, but for the most part they will be unlikable. This is why it will be hard to get into this game, it lacks early on a likable cast. Now don’t get me wrong, the characters are great and fit perfectly into the situation and the world, with the aesthetics really playing to the acid trip that is Danganronpa. It will just be harder to wrap one’s head around when you see broken adults crying and raving about how they want to kill the psychopathic children for having killed their family. This world is messed up and I love how these characters fit really well into it. The character arcs of Komaru Naegi and Toko Fukawa are some of the best I’ve seen in the series and make it all worthwhile in the end. 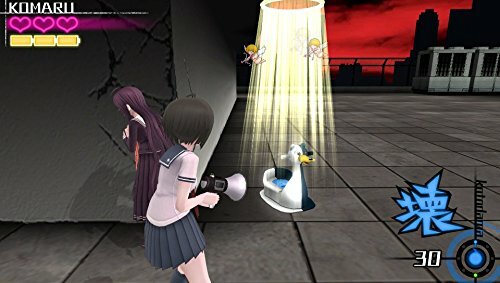 The unique aspect that is game changing in Ultra Despair Girls is the new mechanic, the third person shooter elements. From here we get a new brand of complexity to the game, removing the point and click and visual novel adventure mechanics completely. There is no variety to the third person shooter mechanics, like cover or crouching or anything of the like, with the only versatility being in the “truth bullets” this time around. Truth Bullets are not like those used in previous games, but instead are fired from a hacking gun that is created from a bullhorn. Weird weapon? Yes, but it is Danganronpa so it is to be expected. This weapon is what is fun about the third person shooter side of Ultra Despair Girls. Each different bullet gives a sense of strategy and panic, as you constantly switch between different bullets depending on the situation. It also teaches you about ammo management, as going crazy and firing wildly will cause you to be without a way to destroy the Monokuma. This is the only thing I found remotely fun about the third person elements. The inherent problem I have about this third person shooter incorporation is how bare bones it is. There is no shifting of movement; you are always standing up and feels sluggish even when running sometimes. 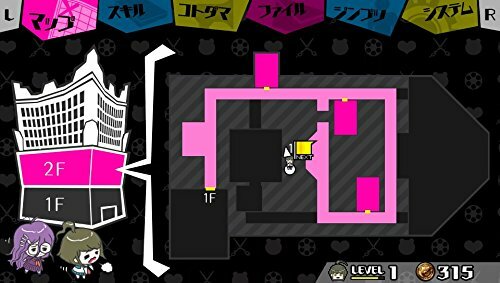 The level design and enemy variation make up for the lack of actual gameplay in these sections, as they allow you various vantage points and ways to avoid or take out Monokumas. The puzzle sections could have been a tad bit more challenging, as it most certainly feels like child’s play (no pun intended). There is next to no difficulty completing the puzzles in the Monoku-man games and the challenges given to you by the children. What I do give them credit for is that they are good practice for learning the new bullets’ capabilities. There is a weird element to the game, and it comes in the form of Genocider Jack. Now you can play as Jack only when you have battery power, and you are invincible and extremely fast in this form. It is basically either an overpowered form for getting out of trouble, or a McGuffin to save you from death with a quick time event. This isn’t the most well thought out ability of the game and lacks weakness, other than the time you can spend in it, but that can be easily changed with abilities. 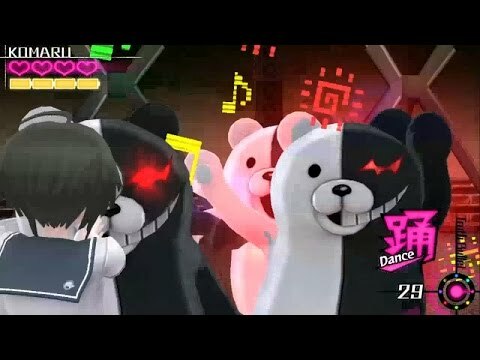 It is fun though to play as your retired friendly neighborhood serial killer and go nuts in certain situations to tear up some Monokuma. They add RPG elements to the game as you level up after destroying enough Monokumas or completing some tasks. This can increase points used to equip abilities you find and obtain during the game. The abilities are somewhat useful, but more often than not the only good abilities are the ones that increase health. The rest are just nice little adjustments to pick-ups, or to slow down your speed, or ramp up your speed of turning; things that can help with little inconveniences. Then comes the attachments to equipment like the bling for the hacking gun or power-ups to the Genocider Jack mode. The hacking gun only has two slots for bling to be placed on each bullet available for upgrading and those bling can be paired to have good and even excellent combos which give an extra boost. They increase the effectiveness, amount of ammo, and the range and width of each shot, so it is advised to use for increasing your attacks. Genocider Jack’s upgrades just make her mode a bit more overpowered than before and isn’t essential in the slightest. Where the abilities feel lackluster, the bling makes a significant difference in ammo management and the effectiveness of bullets. There is a lot to learn about this crazy world and the characters introduced this time around. To make it more enticing, the visual style and music are as strong and as distinct as ever. It has a childish flair to the city in the latter half, and each zone feels like it has a transition over the course of the story. The lighting plays a distinct role in the effectiveness of some areas, as despair and hope often play pivotal roles in how the lighting plays into the characters emotions. The music is as crazy and diverse as the previous games, with its techno style and unique new theme, which is addicting to say the least. There is nothing in this game aesthetically that doesn’t have a place, and the games cinematic cutscenes have variety so that one does not get bored. Each character has a CGI model which is really well detailed, that will often have animation for the scenes where they talk in cinematics. Not only that, but key moments to the story have a little extra touch and are completely animated which feel great. The problem comes in the form of two things: length and load times. The length of cutscenes at times feel too long and it feels as if it is trying to emulate its visual novel roots, but it is bogged down by that very aspect. Also the time between cinematic talks and gameplay are too short, as you walk for a few seconds, only to be thrown into another cinematic. The load times and frame rate issues show from time to time, but doesn’t present a problem, as everything still ran smoothly for the most part. These little problems are what hold back the game technically for me, but nothing slowed down the momentum enough to stop me from playing. Danganronpa Another Episode: Ultra Despair Girls is a strong game in the series for its writing, story, characters, atmosphere, world-building, and some interesting elements to ramp up the gameplay. While there is a pro, there is always a con. To answer the original question in the beginning, I feel like Ultra Despair Girls is on the line between Shadow of the Colossus levels of innovation and Megaman X7. Sure there are some elements that could’ve used more innovation than others, but for the most part, this game is completely solid and amazing at expanding the world of Danganronpa. It is a fantastic outing of the friendship built between two girls as they overcome the despair ridden Towa City, and I for one feel like it deserves to be played if you are a fan of the series and played the previous two games.